So, after thinking it over for a while, I have decided to do one of my very favorite styles. 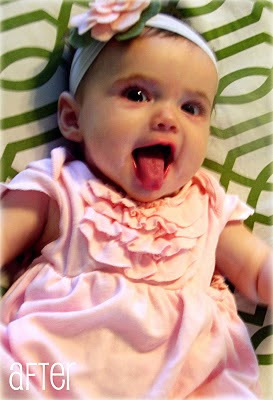 Remember my original ruffle shirt? I used the same idea, but changed it a little bit to give it more of a boutique feel to it. 1. Lay the shirt flat on the cutting board and cut the t-shirt. Cut the bottom, cut the middle part into five parts, that are 2"wide. 2. Take four out of those five loops, cut both sides off to make 2" X 14" strips. The last loop needs to be longer than the others, so cut just one side off. This one will be the ruffle to go on the front neck line. 3. Add lace to the bottom of the strips using a zig-zag stitch. 4. Seal the edges with fray check. 5. Make ruffles. Stitch one side with the largest stitch setting on your sewing machine. Pull one thread to gather the fabric. 6. I wanted to bring the neckline higher for this design, so I cut the very bottom piece of fabric to fill in the v-neckline. Sewed with zig-zag. 7. Pin the longest ruffle to the neckline. I decided not to go all the way around the neck, so when I wear this shirt in the Fall with a cardigan, the back won't be so bumpy. 8. Keep adding the ruffles. Make sure that those ruffles will overlap each other a little bit. 9. Lay the t-shirt flat on table and mark the middle part of the sleeves. Fold the sleeve and stitch two places to secure the pleats. Add button. Many places are having such good sales on summer items right now. If you find great deals on t-shirts, that will be your chance to make a one of a kind shirt for yourself on a small budget! My Four Shirts Four Ways challenge is over, but I will be doing more t-shirt makeovers in the future. They are lots of fun! I didn't eat the whole thing! There was only 1 slice left this morning. And...I am still brainstorming for the last shirt tutorial. Well ladies, what have you been working on? I can't wait to see it! Before the link love post, I want to tell you that I am doing another giveaway this week for one of my sponsors The Pleated Poppy Shop. Please head over to my giveaway page to check out her awesome giveaway (well... after you are done reading this post). You will love her shop! Thank you so much for so many of you linking to the party! Usually I would post link love on Saturday but I had so much going on I couldn't visit all of you and write the post, so I am sorry for making you guys wait! This painting caught my eye...I love the colors splashed on to this piece, and she used fabrics and other things to complete the look. Isn't it beautiful? 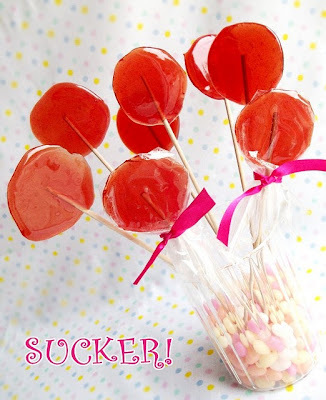 I always wanted to try making old fashioned sugar lollipop (yes, I pick spotlight posts for my benefit... and I hope it will be yours too :) ) They look so yummy and pretty. I'm Topsy Turvy shared a couple crochet toys. 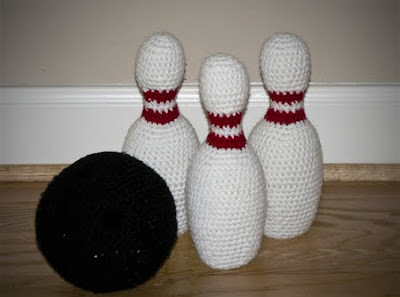 This bowling set put a smile on my face, How adorable!! I wish I could crochet like you! I made a couple aprons for my little girl so she can be my little helper, but never the oven mits. Living with Punks shares Mini-me apron set (you can get patterns too)she created them and they are so cute. 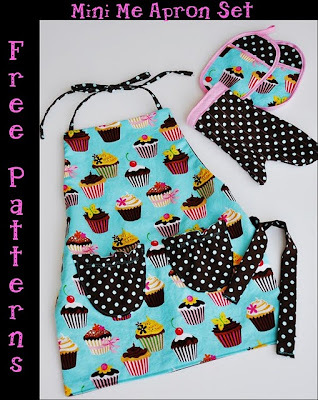 I love the cupcake fabric. This is one of the perfect examples of how ruffles can make everything prettier! Sunshine in My Soul took a plain baby dress and added some ruffles to make it more special for her baby girl. Inspired? Want to sew or craft? Me too! I hope everyone will have a wonderful week. Thank you for visiting Tea Rose Home! I started seeing many fall fashion lines lately... I wanted to make something with that in mind for this shirt. The color of this t-shirt reminded me of my brown boots that would go perfect with this shirt. 1. Take one t-shirt lay it flat, than cut 5 - 2" wide loops. 2. Take two of the loops out of the five loops from step 1, cut the sides off, and cut them horizontally to make 1" wide strips. You should have 8 - 1" wide strips. You will need 7 for the front ruffles. 3. Sew in the middle of the 1" wide strips with largest stitches on your sewing machine. Pull one thread to make ruffles. Place a ruffle in the middle of the shirt and sew it onto the shirt. 4. Make more ruffles. Make the second ruffle less rufflely than the first one(see the picture). Place it right next to the first ruffle and sew. 5. Repeat the process. From left; 1, 3, 5, 7 - less ruffly. 2, 4, 6, normal ruffle. 6. For the sleeves, find the middle and fold the sleeve like the picture to make a pleat. Sew it to secure the pleat. Add a button to hide the stitches. 7. For the bottom of the shirt, take 2 - 2 "wide loops, cut one side to make them in to strips. Piece them together to make one big loop. Use the largest stitches, sew both side of the edges. Pull one thread from both(top & bottom) to make ruffles. They won't be too ruffly, just little bit. For the thin ruffle above the thick ruffle, take 1 - 2" wide loop, cut in half horazontally to make a 1" wide loop. Then cut one side open to make strips. Piece these two strips together to make a loop. Sew in the middle with the largest stitches, pull one thread to make ruffles. 8. To add the thick ruffle to the shirt, twist it every now and then and pin. Sew in the middle. Also, I sewd along the big stitches that made ruffles with zig-zag stitches to give some stability and character. Sew the thin ruffle loop in the same manner as the thick ruffle loop. With this, I only sewed the middle of the strip. 9. Ta da... It's finished! I was thinking that I could wear this shirt paired up with a long sleeve shirt underneath or with a jacket over it. Next week is my last four shirt four ways post... I haven't decided what I am going to do, but be sure to come back to see what I am up to! Wow... I didn't realize my next two weeks would be so full until last night. Usually, when I feel like I have so much going on I would write a weekly schedule and daily schedule on a piece of paper, also a to do list according to the deadline and priority beside each item. Then I would scratch them off as I go through the list. Usually this method works. If I can see what needs to be done, most likely I won't forget. Also, as I scratch off the things on the list, I feel a sense of accomplishment. One of the things for me on my list today was to put some stitchery kits together for Young Women's camp (A program for the young girl's at my church). How has your summer has been so far? Between your family reunions, trips and all the other things, are you still crafting? Here is your chance to share with us! Hi everyone, how was your weekend? I had a wonderful time with my family and friends and this Monday I am supposed to meet up with my friend who used to live next door to me but moved far away. I am so looking forward to seeing her! Today, I am hosting a giveaway for The Toasted Coconut! Go to my sponsors' page to get to know about her and enter the giveaway. The Blueberry Monkey made Lydia Dresses using Pink Fig Patterns. I have never used their patterns before, but she said they are very easy to follow, that is always good to know. The dress turned out so nicely! Unfortunatly I can't post a picture here, but, please go visit her site! Cupcakes have become really popular in the last little while. Sometimes I watch DC Cupcakes on TLC and drool over them (why do I do that to myself, I have to fight the urge to bake cupcakes and eat them in the middle of the night). Anyways... going back to the link party, The Fickle Hobbyist shares how to make Cupcake Bath Bombs. I would love to give it a try. Wouldn't it be fun to have girls night with cupcake theme party? 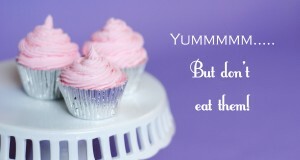 Start with cupcake invitation and make cupcake bath bomb together, then eat cupcake for a treat? I am Momma Hear Me Roar shares her leather corsage. I don't have experience in using leather myself, but I always have been interested. She makes it look so simple and easy that I think I want to try working with leather now. Very pretty and chic! I usually tie a ribbon to identify my luggage, but no more! Project Naptime has shown a wonderful and creative way to make your luggage stand out to you and be more stylish than the other pieces around it. These luggage taglets are so pretty and useful. Ahhh... I want to start working on some more projects. My "Someday I want to make this list" keeps growing every week. How about your's? When I was brain storming some t-shirt refashion designs for the "Four Shirts Four Ways", I wanted to work with the navy shirt first, but I couldn't quite finalize the design. I am so happy that I was able to make the shirt almost exactly the way I pictured it in my mind. 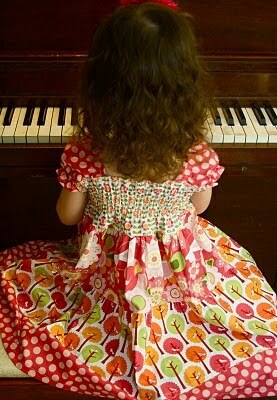 It might look a little more complicated than my other ruffle shirt, but don't be afraid! It is quit simple, it is just a little time consuming when sewing the beads on, but the result is totally worth it! 1. Take one of the t-shirt, lay it flat on the cutting board, make sure that there are no whrinkles. Cut 4 - 2 1/4" wide strips. 2. Cut one side of the 2 1/4" loops to open the loop and make it in to strips. Piece two strips from the bottom to make a slightly larger loop, and take the other two pieces put together to make a slightly smaller loop. 3. Using large stitches, sew 1/4" from the one side and go all around the loop. Pull one thread to gather the fabric to make ruffles. 4, Pin the larger ruffled loop to the bottom (little above the seamline of the bottom) and sew. Pin the smaller ruffled loop above the first ruffle (so that the second ruffle will overlap a little with the first one) and sew. 5. Cut 2 - 1" wide loop from the t-shirt. Cut oneside open to make strips. 6. Sew in the middle of the strips in the same manner as step 3 to make ruffles. 7. Place the ruffles as you desire and pin them. It will be helpful to play around with it for a little bit to see what you like. I did mine on the left side of the neck and the right side of the bottom. 8. I wanted to make this ruffle shirt different than my other ruffle shirt, so I sewed some beads to give it a little sparkle. I couldn't help but try on my new shirt... Our anniversary is comming up, this shirt might be the "one" for our date.